Visit the Youth Department to drop in at the STEAM Station to see what is new each week! Construct, crash, chuck, create, and collaborate solutions to rethink how and why things work. Challenge the traditional ways of thinking and apply your ideas and then check a book out to learn more about inventing. 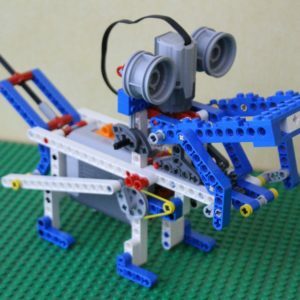 Build a team with your friends and build a bot out of Lego Technic bricks that has powered moving parts. These bots live at the library, but we will snap a photo if you choose to submit your creation to Lego Life Magazine. 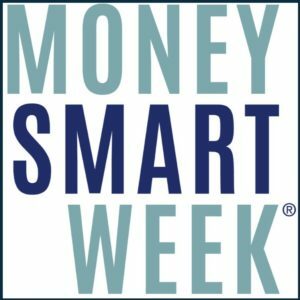 Listen to a money smart story, learn a magic origami money fold trick and make a robot bank to take home. Pick up information about how to start saving and managing your money from your local Charlevoix 4Front Credit Union. Take home a copy of Cinders McLeod’s Money Bunny book and some freebies from 4Front Credit Union! Make a battery powered robot alien out of a toothbrush and learn how electricity works to power up your mind with electric ideas. Weekly Ongoing • All Ages • Drop In Program. Get going galactic with our challenges this spring as we gear up for the theme of Universe of Stories this summer in commemoration of the 50th Anniversary of the Lunar Landing on the Moon. 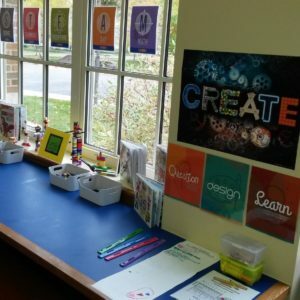 Check out what is new at our weekly Science, Technology, Engineering, Art, and Mathematics Station.